Another beautiful display of Iowa's natural and man-made wonders, "This Thing Between Us" is a part memoir, part photo collection inspired by the book "The Bridges of Madison County." 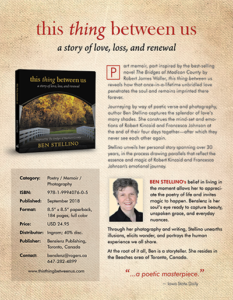 “This Thing Between Us” reveals Stellino’s personal story spanning 30 years, drawing parallels to the bestselling novel “The Bridges of Madison County” by Robert James Waller. In 1992 a book was published that became a best-selling sensation. It brought the covered bridges of Iowa’s Madison County into the hearts and minds of readers the world over, including Ben Stellino. Head out to Roseman Bridge to meet Ben Stellino from Ontario, Canada. 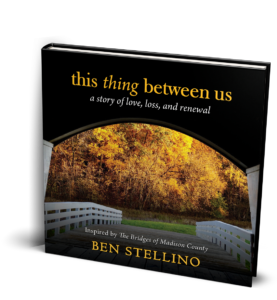 Ben’s book this thing between us is inspired by Robert James Waller’s Bridges of Madison County. "Author Stellino pays tribute to The Bridges of Madison County in her debut book"
"Waller's 'Madison County' inspires a new book of photos and poetry"